Dinosaur Comics - May 5th, 2008 - awesome fun times! May 5th, 2008: Chris "Reprographics" Yates has a new book out for sale that looks pretty great! Reprographics is a fun comic because all this crazy stuff happens in it, but it's a photo comic, so you know that Yates was out there actually doing this stuff. It makes me say, Yates, you so crazy! Also your friend and mine Jason Eppink has made some more cool stuff: check out his twenty-first century campfire. I also like his A Group Of Images And One That Does Not Belong (2) (3) (4). 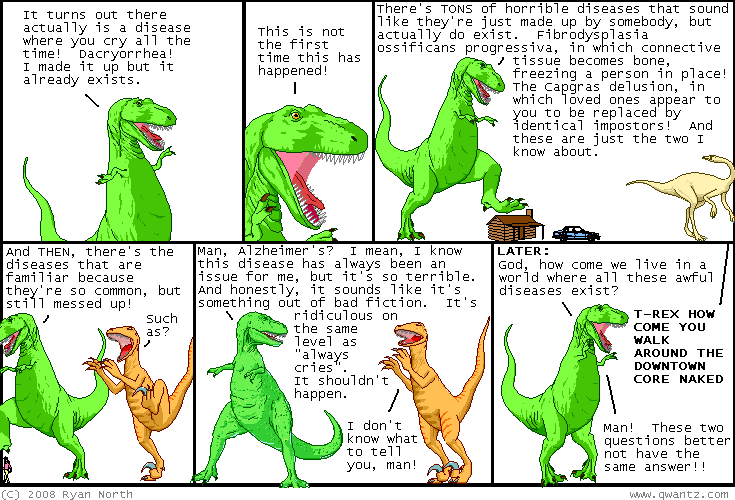 One year ago today: if this is the first dinosaur comic you've ever read then let me explain. the italics are sinister raccoon and cephalopods who are t-rex's neighbours. they want t-rex to come bleed with them. the bold is god. only t-rex can hear god. USUALLY, there are more jokes about boners.